Menopause is a natural stage in life that every woman goes through. 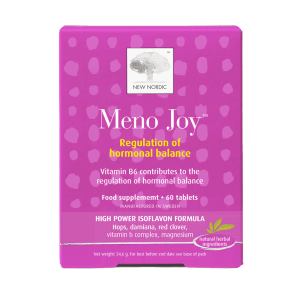 Meno Joy provides nutritional support during this period of change. The Meno Joy tablet is based on a combination extract of hops and red clover, which provides a variety of natural isoflavone types. Red Clover helps you maintain a calm and comfortable menopause. Meno Joy also includes natural extract damiana, magnesium, and vitamin B. Magnesium and vitamin-B contributes to normal function of the nervous system and reduces tiredness and fatigue. During menopause, a woman’s ovaries produce less oestrogen and progesterone. Vitamin B6 further contributes to the regulation of hormonal activity. The tablet’s content of magnesium and vitamin D contributes to the maintenance of normal bones. Vitamin D also contributes to the absorption and utilization of calcium from the diet. Take 2 tablets per day with or immediately after any main meal. Use for a minimum of 2 weeks. Food supplements are intended to supplement the diet, and should not be a substitute for a varied diet or healthy lifestyle. Do not exceed the stated dose. Caution: Seek professional advice before using if you are pregnant, breastfeeding or suffer from allergies. Warning: Not suitable for children under 12 years of age. Do not use if blister package (inner foil) is broken or tampered with. Keep out of reach of children. 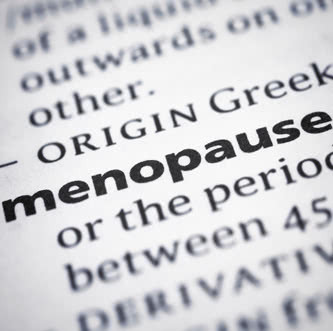 For those who find it difficult to handle the typical signs associated with menopause. For those who want to control hot flushes, sweating, restlessness, and mood swings. For those who want to have control over your body’s natural hormonal activity. The red clover is the national flower of Denmark. It is found natively in Europe, Western Asia, and northwest Africa. The flowers are dark pink with a paler base, 12–15 mm long, produced in a dense inflorescence, and are mostly visited by bumblebees. It is widely grown as a fodder crop, valued for its nitrogen fixation, which increases soil fertility.Red clover is commonly used to make a sweet-tasting herbal tea. Red clover contains contains coumestrol, a phytoestrogen. Damiana is a shrub native to Mexico. Produces small, aromatic flowers. It blossoms in early to late summer and is followed by fruits that taste similar to figs. The shrub is said to have a strong spice-like odor somewhat like chamomile. Damiana is an ingredient in a traditional Mexican liqueur and Mexican folklore claims that it was used in the ”original” margarita. Damiana has a high diversity of flavonoids and is popular in traditional herbal teas for women. Hops are the female flowers of the hemp plant. The plant originated in northern Europe and North America. Hops have been used for centuries in beer production, because of its characteristic bitterness. It was for many years known that female hops pickers in menopause was affected by the plant. In 1953, researchers found Kock and Heim that hops possess plant estrogenic activity. 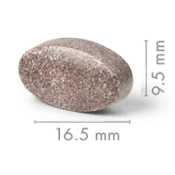 The hops in this tablet is picked, dried and extracted to concentrate and standardised the content of isoflavones. It is your guarantee of a high and consistent quality. Take 2 tablets per day with or immediately after any main meal. Use for a minimum of 2 weeks. Food supplements are intended to supplement the diet, and should not be a substitute for a varied diet or healthy lifestyle. Do not exceed the stated dose. Caution: Seek professional advice before using if you are pregnant, breastfeeding or suffer from allergies. Warnings: Not suitable for children under 12 years of age. Do not use if blister package (inner foil) is broken or tampered with. Keep out of reach of children.